Archival Methods Museum Board is for matting, mounting and preservation of fine prints, precious documents, traditional and digital photography. For window mats and mat backing Archival Methods recommends a thickness of 4-Ply, which creates a 1/16" separation between artwork and glazing and provides a flat, supportive backing.Your best print deserves the best mount possible. Presentation is half the battle and Archival Methods gives you the way to show off your best work. This is quality board designed for archival display. Bienfang / Seal 250 ( 210MX ), 18.5" x 23" Dry Mounting Press Kit. 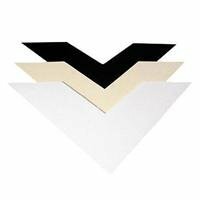 BlackTie 4x6 photo folders - 400 pack. Simply White 4"x6" / 5"x7" Photo Folders - 400 pack.